If you know of any businesses that offer student discounts by showing your RebelCard, please let us know. Stop in and tell us so we can compile a list to keep you informed on how you can do more with your RebelCard. If you would like to be added to the discount vendors list, please fill out the Discount Vendor Form, and send it to us as rebelcard@unlv.edu or send it by fax at 702-895-2518. Showpo Offers 10% off everything sitewide for UNLV - Excluding gift cards, sale and beauty items. Use code UNLVSHOWPO10 at checkout to redeem. 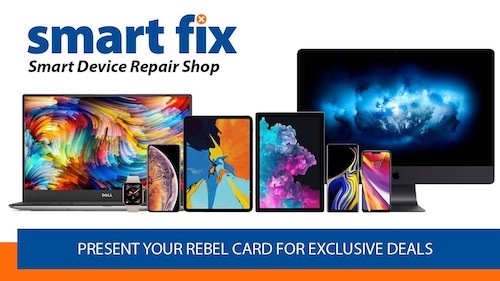 Smart Fix Free computer diagnostic with repair + 25% off labor, $15 Off iPhone/iPad repairs , $10 off Samsung device repairs, one discount per visit & must present RebelCard at check-in. 24 Hour Fitness Join 24 Hour Fitness between March 18, 2019 – April 8, 2019, and get your first month free with your Corporate Membership Discount! Already a member? Add your Family & Friends today and they can receive their first month free! Not ready to join just yet? No problem! Register for a 7-day gym pass to try out the club of your choice before joining. Big Chicken Offers 10% off with Student ID. Evolution Yoga $59.99 a month with proof of RebelCard. Top10VPN Offers a range of VPN subscription services at a discounted rate. Discover Car Hire Use the link to receive a 30% prepayment discount on an online car rental booking. HRank 10% refund on webhosting fee for students and teachers. Send requests from an official .edu email when signing up. VegasToyCon 50% discount with proof of RebelCard when buying a ticket at the door on the day of event. Offering a permanent 10% discount on all gym, fitness and running headphones at our store. Traffic Tickets 25% off our online Defensive Driver Course. EXACT Communication Translation & Interpreting 17% off document translations with proof of RebelCard. Fractured Prune 10% off anything in store with proof of RebelCard. Wireless Doctor Computer Solutions at 2315 E Cheyenne Ave Get 50% off labor for iPhone screen repair and iPad screen repair with proof of RebelCard. Triducna Enjoy 15% off storewide with code EDU15PSM at checkout to apply discount. EZ Fix Appliance Repair Show proof of RebelCard to receive 5% off all appliance repair services. Canvas Avenue Enjoy 10% off storewide with a minimum spend of $40. Enter code UNLV10 at checkout to apply discount. Best Buy Best Buy offers a variety of student deals with the creation of an account. ReadingGlasses.com 10% off online orders with code "TEACH10"
U-Swirl Frozen Yogurt and Rocky Mountain Chocolate Factory Save 15% off entire order at the Cheyenne Ave location when you present a valid UNLV ID. Cannot be combined with other offers. The Black Tux Use code UNLV20 for $20 off your suit or tux rental. Jawzrsize 10% discount with promo code: STUDENT. Ship A Car, Inc. Offers $25 off all nationwide auto transport services with promo code UNLV-DISCOUNT. Cristina Ramella Offers 20% off with code: EDU20. MoversHire Receive free moving quotes and a $70 gift check for available utilities. Need a valid Employee ID and use the coupon code "MOVERSHIRE70" at the time of final billing. Vegas Used Cars $100 gas card with purchase of any vehicle & 10% off extended warranty with proof of RebelCard ID. Physiqz Free personal training session for any students of military background (up to 3 per month). Free 24/7 gym access for students of military background. Free personal training session for any students (up to 1 per month). UNLVtickets Get $7-9 off tickets to the Harlem Globetrotters at the Thomas & Mack Center on Sunday, August 12th at 4 p.m. Purchase tickets online with promo code "PATRICK"
FirstSiteGuide Free Blog/Website setup service to all UNLV students worth $29.99/$59.99. Email us with subject: UNLV blog setup. National Express National Express is offering 15% off of all auto transport services to students. Must provide valid employee I.D. at the time of booking the service or use school email address to have discount applied. UpLead Offers 10% off with code: REBEL10. Lapigems Offers 15% off sitewide. Email nicky@lapigems.com for the promotional code. Supwatch With discount code: S-25%OFF, you can immediately enjoy a discount of 25%. KaTom Restaurant Supply Inc. 10% off all Dexter Russell knives. Email Stevi Lewis (slewis@katom.com) or call 865-225-1545 for the code. Company Folders Offers 10% off with code UNLVEDU10. Diamonds-USA Get 10% discount for engagement ring settings, earrings, pendants, in the "Design your jewel" path with code RebelDiamonds. RentalCover Offers 30% discount. Contact customer support with a university email to receive discount. FreightPros Call or email to receive 10% off freight and shipping prices. uBreakiFix offers 10% off all repairs excluding Samsung devices when RebelCard is shown. All Language Alliance, Inc. Legal document translation service in 100+ languages. 15% off with code: ALA15OFF. Wellness Body Wraps Health Studio 10% discount on any regular priced service to any faculty/student. Must show UNLV student ID. New clients receive 50% off 1st Infrared Therapy &/or Hyperbaric Session. Vineyard Vines 905 South Grand Central Parkway location offers 15% off one full price item + free custom sticker with purchase. Wallpaper Boulevard Enter code UNLV15 and receive 15% off your purchase. Pearly Whites 10% discount when using code "UNLV10"
Resumates 20% off premium resume printing and delivery with code student20. Juice 'N' Go Juice 'N' Go on 1735 S. Rainbow Blvd offers 15% with the presentation of a valid student ID. Scotch and Soda Scotch and Soda on Las Vegas Blvd offers 15% off with a valid student ID on in store purchases. VPNoverview Offers discounts varying from 30% to 72% on various VPN services through the links. StubZero Save 10% and pay zero service fees on 100,000 Concerts, Theater, Broadway and Sporting Events. Use promo code EDU10 at checkout to receive discount. MeetIDEA 15% off with discount code "UNLV15 " and a UNLV email as the order email. 1-800-Petmeds Offers 20% off with the use of the attached link. Offers 10%-15% off next months payment. 20% off food + beverage bill for current students. Must present student ID card. Not valid with other discounts or offers. Maryland Parkway location only. Dine-in only. Coastal Creative Use code CC50 for $50 off your order. Resume Go Use discount code UNLVCOUP for 30% off the "Premium" package. Factory Direct Promos Take advantage of next column pricing on eco-friendly promotional products from Factory Direct Promos. KyouBeautySalon KyouBeautySalon offers 15% off nail services & waxing, 30% off eyelash extensions, 40% off deep tissue massages, $39 Basic Facials (60 mins), $70 acne normalizing facial (120 mins). RCG Auto Logistics Offers an exclusive 10% discount on vehicle shipping anywhere in the United States. Mention the code "NLV10 " at booking or over the phone. Paul's Auto Service Offers Free Diagnostic and/or 10% off Labor. 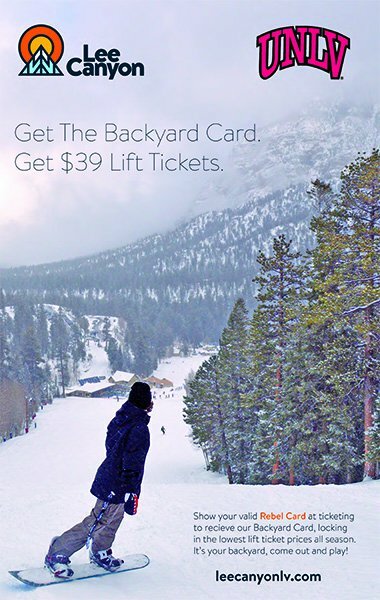 Tech 2U Offers $50 off for students when they show their RebelCard. 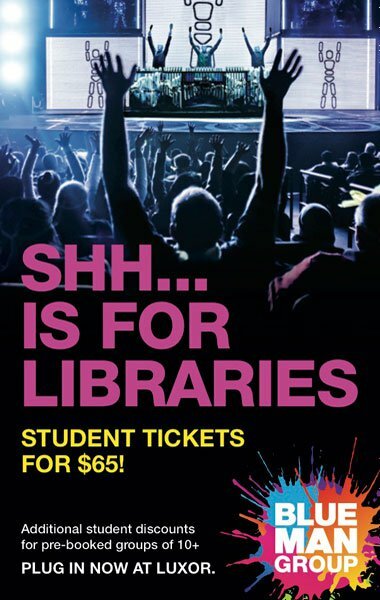 Blue Man Group UNLV students and faculty receive discounted tickets by showing RebelCard at Blue Man Group Box Office. UNLV SRWC Free to all students taking 4 or more credits. Stephano's – Maryland Parkway Free drink with any plate or bowl purchase. Luxor 50% off Bodies: The Exhibition and Titanic: The Artifact Exhibition admission. Tommy Hilfiger – Premium Outlet North and South 10% off your entire bill. InMyArea.com Offers easy to use tool for students free. moveBuddha.com UNLV students, alumni, and employees earn $50 in moving supplies (boxes, bubble wrap, etc.) when they book an interstate move through moveBuddha. Ironcompany.com You can use the discount code “UNLV6” at checkout for a 6% discount on all fitness equipment and accessories. http://heroicsearch.com Offers 10% off on all monthly plans, consulting fees, and link building services they offer. Send an email with the subject line "25offedu" to info@heroicsearch.com for more details. Enjoy 10% off with code UN10LV at checkout when making purchases of $50 or more. Hotel Planner Save Up to 65% at over 200,000 Lodging Options Worldwide!